We've modified the code to work using an ESP8266 which publishes the measurement data directly on an MQTT stream. This project is about hacking the Voltcraft CO-100 CO<sub>2</sub>-meter, such that we can read the exact ppm value as displayed on the LCD. This particular CO<sub>2</sub>-meter is present in the main space of RevSpace. Having the CO<sub>2</sub> ppm value available as a number allows for nice things such as logging the levels over time, announce them on IRC, show them on the [[LedBanner]], fine-grained control of the ventilation system, etc. 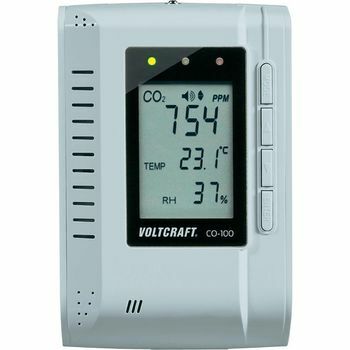 This particular CO2-sensor is present in the klusbunker at RevSpace and is currently used to control the ventilation in a crude manner (by monitoring the warning LEDs on the display module). Having the CO2 ppm value available as a number allows for nice things such as logging the levels over time, announce them on IRC, show them on the LedBanner , etc. "Achtung! Der RJ45-Anschluss (siehe Kapitel 7, Position „K“) darf nicht verwendet werden. Der Anschluss ist nur für den Hersteller vorgesehen." 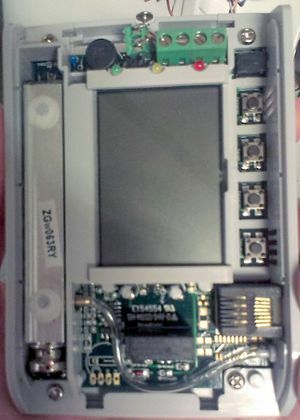 The CO<sub>2</sub> sensor inside the CO-100 (in the left of the picture) has a sticker saying ZGw063RY. Googling for this number reveals a CO<sub>2</sub> module that looks just like the Voltcraft CO-100, so it appears that the CO-100 is basically a rebranded [http://www.zyaura.com/products/ZGw063.asp ZyAura ZGw063RY] module. 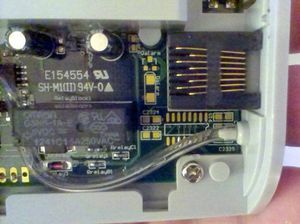 The CO2 sensor in the CO-100 is a [http://www.zyaura.com/products/ZG_module.asp ZyAura ZG-01 module]. This sensor uses the ZyAura protocol, which vaguely resembles SPI, see [[File:ZyAura_CO2_Monitor_Carbon_Dioxide_ZG01_Module_english_manual-1.pdf|ZG01 CO2 Monitor Module user manual]]. The CO<sub>2</sub> sensor in the CO-100 is a [http://www.zyaura.com/products/ZG_module.asp ZyAura ZG-01 module]. This sensor uses the ZyAura protocol, which vaguely resembles SPI, see [[File:ZyAura_CO2_Monitor_Carbon_Dioxide_ZG01_Module_english_manual-1.pdf|ZG01 CO<sub>2</sub> Monitor Module user manual]]. * byte 0 is an identifier for the measurement item, e.g. whether it is a CO2 ppm value or a temperature. * byte 0 is an identifier for the measurement item, e.g. whether it is a CO<sub>2</sub> ppm value or a temperature. * byte 2 is a checksum over bytes 0-2, just the sum modulo 256. * byte 3 is a checksum over bytes 0-2, just the sum modulo 256. Besides the CO<sub>2</sub> ppm value and temperature, it also sends various other (so far unknown) measurement items. | 0x41 'A' || 3290 || ? | 0x43 'C' || 2964 || ? | 0x46 'F' || 6882 || ? | 0x46 'F' || 6882 || Temperature in degrees Fahrenheit (unit of 0.01)? | 0x4F 'O' || 7754 || ? | 0x52 'R' || 10438 || Barometric pressure? | 5V || ? || Supply voltage from 8P8C, about 6V! The basic function of the software on the arduino is to monitor the C and D signals, until a CO<sub>2</sub> measurement is received from the ZG-01, then send it using the wireless transceiver. * one for an ESP8266, sending measurement values directly to MQTT over the WiFi. The technical description for a very similar CO2 module: [http://www.zyaura.com/support/demo/ZG106_FW_001.ExtSpec.pdf ZG106 protocol]. [https://github.com/gcopeland/RF24 gcopeland fork of the RF24 library]. * revspace/sensors/co2 with the CO2 concentration in ppm, e.g. "400 PPM"
* revspace/sensors/humidity with the relative humidity in percent, e.g. "43.56 %"
* revspace/sensors/temperature with the temperature in degrees Celcius, e.g. "23.9 °C"